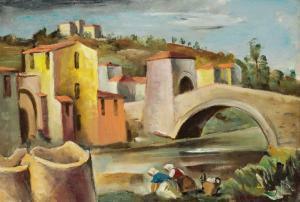 Find artworks, auction results, sale prices and pictures of Mokry Frantisek at auctions worldwide. 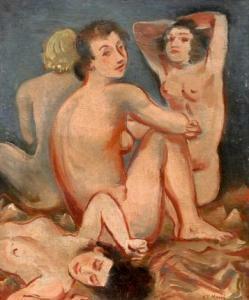 MOTHER WITH CHILDREN. 1915. 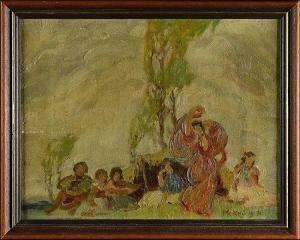 Oil on canvas, 23,5x30 cm, signed and dated lower right \‘Mokrý 1915\’\’\’\’. Framed. Condition A/B. MATKA S DĚTMI. 1915. Olej na plátně, 23,5x30 cm, sign. a dat. vpravo dole „Mokrý 1915\“. Rámováno. Stav A/B. 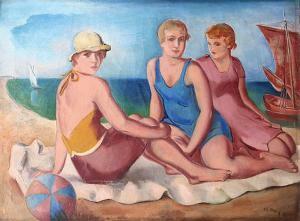 Oil on canvas, 75 x 101 cm, framed, dated 1932, signed lower right. Czech genre painter and graphic artist, he studied at the Academy of Decorative Arts in Prague and under J. Preisler at the Academy of Fine Arts.